Argentine citrus multinational San Miguel has secured US$100m of financing for nine years to fund its future expansion of its citrus and non-citrus production in Argentina, Uruguay, Peru and South Africa. Under the terms of the deal, IFC and BID Invest will each contribute US$27.5m and Rabobank will provide US$100m. IFC and BID Invest will also advise San Miguel on the implementation of good environmental practices in key areas, such as wastewater treatment. “We welcome IFC, IDB Invest and Rabobank as partners in our effort to strengthen our position as a multinational Argentine company as we expand into new markets and continue to drive our sustainable agribusiness model,” said Romain Corneille, CEO of San Miguel. The financing package has been secured for a nine-year terms, which is longer than what is currently available in the market. This is essential for this industry, since citrus trees take at least five years to produce quality fruit for export. The financing will contribute to San Miguel’s US$132.5m investment plan to expand its operations in Argentina, Uruguay, Peru and South Africa and grow its production volumes of citrus, table grapes and avocados. “We are proud to continue our work with San Miguel to expand its operations. The company is an example of how Argentine companies can compete successfully in the world and create jobs where they are most needed,” said David Tinel, IFC regional manager for the Southern Cone. Aitor Ezcurra, head BID Invest’s corporate division, added: “The financing offered by BID Invest to San Miguel seeks to support one of the most important fruit exporters in Latin America and the Caribbean, improving the export capabilities of three destinations, such as Argentina, Uruguay and Peru, and generating employment in the rural areas through operations implemented in a sustainable manner”. Rafael Bonasso of Rabobank said the bank had provided ongoing support to agribusiness companies in Argentina for 25 years. “We hope to continue providing support to our customers in the coming years,” he said. The lemon industry in Tucumán employs 40,000 people and produces 1.3m tonnes of lemons per year. The industry exports lemons and related products to Europe, the US, Canada, Russia, Hong Kong and the Middle East. San Miguel is the biggest grower and marketer of fresh citrus in the Southern Hemisphere. With nearly 10,000ha of production in Argentina, Uruguay, South Africa and Peru, it supplies more than 200 clients in 80 countries. 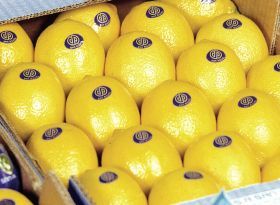 The company processes 400,000 tonnes of citrus a year and in the last campaign exported 124,000 tonnes of fresh fruit. In August 2017, San Miguel added grapes and avocados to its offer through the purchase of Peru’s Agrícola Hoja Redonda.